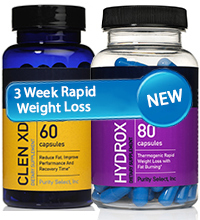 We simply clubbed together two of our weight loss Super Brands – Hydrox Slim, our tried and trusted weight loss pill and our acclaimed fat burner Clen XDV. So with Hydrox Slim working quietly in the background, Clen XDV will aggressively target and burn that ‘hard to get rid of’ fat. And the great bonus benefit is that with these two working in tandem you don’t need to do anything else to lose weight. No special diet, no grueling fitness regimen. Of course we do encourage you to adopt a healthier lifestyle from a long term health perspective. But the fact is that when you opt for this package you can easily lose weight in just 3 weeks, while simply continuing your normal daily routines. Hydrox Slim – Take 2-4 capsules mid-morning or mid-afternoon. Take 30 mins prior to meals or exercise. Buy 3-Week Rapid Weight Loss Package Online – With a 90-Day Money Back Guarantee! Oh yes! We are giving you complete assurance that our exclusive products Clen XDV and Hydrox Slim will work in tandem to help you achieve that elusive goal – rapid weight loss. Clen XDV will ensure increased metabolism, burning those excess calories, suppress that insatiable hunger, and increased energy levels. Hydrox Slim will work quietly in the background, ensuring that you lose weight healthily, prevent any additional bloating and most important ensure that you achieve a nice, well muscled, well toned look. We want to provide you complete reassurance that you have made the right choice. This comes in the form of a full refund if you are not satisfied with the results. All you need to do is return the empty/unused bottles to us and we will give you a full refund, minus a nominal shipping and handling charge.